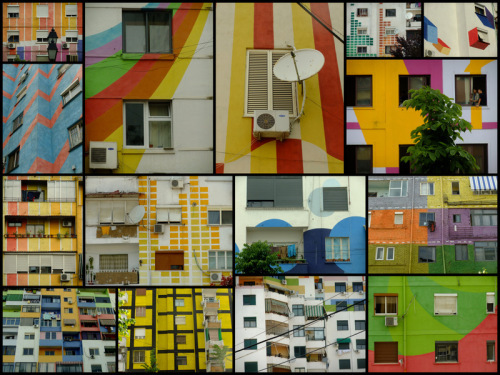 "Tirana, Mon Amour" - Can you fall in love with a city? 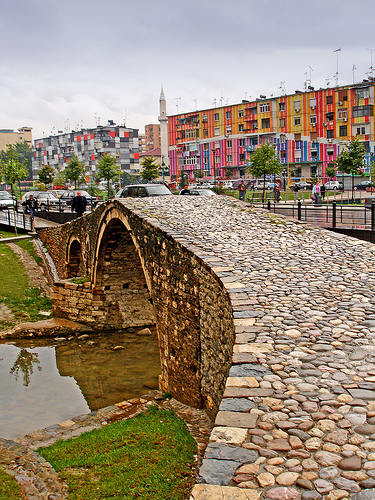 "Tirana, Mon Amour" – Can you fall in love with a city? Can you fall in love with a city? My answer is yes. Because that's what happened to me coming to Tirana. In my imagination I thought of it as a gray and sad place, as it happens when a country suffers a communist regime, which in this case has lasted over forty years. Others did not know why the filtered news were so scarce or non-existent. In fact, even today it is a country ignored by the press and television, almost unknown as a touristic place for the mass or the elite. Although, I must add that lately, the situation is constantly changing for the better. Arriving at the large and a well-kept airport of Tirana, full of hospitable people that you meet who just naturally ask if you needed any help made me understand that something so sudden and beautiful will happen to me. Along the long road that leads to the city, surrounded by hills covered in green which lightened the gray streets, I was gazing through the cab window and started thinking that I may be up to a pleasant surprise. In fact, arriving at my small but attractive hotel, which was once a small villa where I used to come in the past, I felt myself at home because it is so expertly restored with white and blue colors and a very inviting atmosphere, in general. The girl at the front desk welcomed me in perfect Italian and took my heavy suitcase to my room with a smile of someone who is truly happy to do you a favor. Courtesy and kindness is in the DNA of these people. Without arranging my clothes in the closet and being anxious to immerse myself in that unknown world, I take the first taxi that brings me to the famous Skanderbeg Square, one of the few places of which I was aware of. I was holding tightly to the arm of the taxi hovering among rows of cars, with my heart almost dropping, seeing real pirouettes in the middle of a messy and chaotic traffic. You arrive at the destination, along the crowded streets of young people dangling smiling and filling the coffee bars which are all interrelated through the streets of the city. There is an explosion in the air of vitality, joy, enthusiasm, involving those like me who are bored by the consumerist idleness of our Country. It ‘nice to talk to anyone who approaches you, I’m an open minded person and they are just so interested in knowing where you come from, ready to open up and talk about their studies, their job prospects, regardless of the fact that in reality the ‘economy’ of the country is not the strongest. In fact, in Albania it is really affordable to live in, especially in comparison to the cost of the large western cities. A full meal for two people costs only 20euros, a coffee a few cents and the same applies to drinks, alcohol, fruit and vegetables. So for those who enjoy a low cost holiday, Albania is an ideal country. At least, I’d say for now though, because I have the feeling that tourism is going to explode here and so things will change rapidly. Here you can find freedom of religion, a peaceful coexistence between different religions: Orthodox, Muslims, and Catholics. It was the same case even during the Communism regime in which Albanians had no fear of witnessing to their faith. For those coming from outside it raises a certain curiosity mixed with wonder to see the young girls that roam around the city all in very short skirts or shorts, but yet they are the same ones that attend their mosques. Albania has a high and warm Hospitality Culture which is also observed in the various small gestures, such as an unexpected hug, a handshake which is particularly welcomed, accompanied by kisses. It’s also with a really warm affection. The City is a tangible example of how we can transform anonymous buildings in joyful colorful architecture. The merit of a former mayor, now prime minister Edi Rama, revered as a God and declared by Time Magazine “Man of the Year” in Europe, in 2005 who was an impromptu painter that painted the whole center of Tirana in Pompeian red color combined with pastel green, yellow ocher which it resembles St. Petersburg. The enormous avenues, lined with giant trees, compete with those spacious ones in Paris. The yellow cabs, which run through without interrupting the city, they remind me of New York, although here a normal run costs only 2euros. In short, it’s a cheerful city which is full of shops with goods of all kinds that are open late on Sundays and a city filled with high quality restaurants, concert halls, theaters and nightclubs. There is Block, a square of roads, which were once off-limits to people, because they lived through the dictatorship surrounded by his hierarchy. Now it is a kind of Montmartre reserved to young people here who spend their evenings drinking, smoking and having fun. The places to visit there are not too, too many, but some of them are really nice, such as, the Orthodox Church with a portal of solid gold as the baptistery in front, while the inside front of the altar has lined up a row of religious images aligned as in the Basilica of San Marco. The various Mosques that stand high in the sky send those sweet sounds of the muezzin, the Museum, the Gallery of Modern Art, where they staged an exhibition of the painter Lin Delija who was forced, to flee and seek refuge in Italy during the communist regime, precisely in Antrodoco, a beautiful place in Italy, where he carried on with his business, becoming one of the greatest painters in Albania. Then there are those historical curiosities as the Pyramid that Hoxha had built for his tomb, which is now almost ruined as the covered marble is fading away. We are on the edge of the bridge that crosses the river, a sort of long stalls, where Booksellers flock from their boxes, separating a quantity of used books in the various sectors and foreign languages. An open literature market that indicates how developed the interest for the culture has become. First published in Italian language by Carla Tagliarini under the title “Tirana, Mon Amour” .